This workshop makes use of the Intercultural Conflict Style(ICS) Inventory, which describes an individual?s preferred approach or style for resolving conflict by reflecting the individual?s culturally learned patterns for dealing with disagreements. The Augsburg Music Department is pleased to host several High School Jazz Ensembles at this year's Augsburg JazzFest with guest clinician, Carlos Granthon from Lima, Peru. Students are invited for weekly worship including singing, a biblical message, holy Communion, fellowship and snacks. All are welcome! This year for the fifth time, Augsburg will welcome nearly 1,000 students and community people to campus for the Nobel Peace Prize Forum. This year's forum will be held on Friday and Saturday, March 5 and 6. Each forum honors and focuses on the work of the previous Nobel Prize laureate; this year the spotlight is on 2008 Nobel Peace laureate, Martti Ahtisaari, international peace negotiator and former president of Finland. He shares a particular connection with Augsburg as he considers the most satisfying work of his career to have been the 13 years he spent as the UN diplomat leading the negotiations for the independence of Namibia. 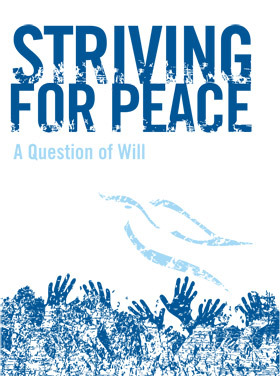 The theme of this year's forum, "Striving for Peace: A Question of Will," comes from Ahtisaari's Nobel lecture, in which he says, "All conflicts can be resolved. War and conflicts are not inevitable. They are caused by human beings, â€¦ Peace is a question of will." Speakers, panels, seminars, and two movies will provide many perspectives on peace—interfaith dialogue, women's activism, democracy-building, lessons learned from Namibia's independence, and many more. In addition, the forum features art exhibits, music performances from the Dustin Thomas Band and Marimba Africa, and an International Peace Fair. The forum opens Friday with a ceremony featuring Augsburg students in choreographed aerial dance and a commissioned choral work from Finland by the Augsburg Choir. President Ahtisaari will follow with his keynote address. The second plenary session on Saturday morning features Ahtisaari and Kjell Magne Bondevik, former prime minister of Norway and president of the Oslo Center for Peace and Human Rights. On Saturday afternoon, Liberian women's movement leader Leymah Gbowee will close the forum with a call to action, talking about her work in bringing together women of all faiths as an effective political force to demand an end to violence. The award-winning documentary film about Gbowee and this movement, Pray the Devil Back to Hell, will be shown. Another film to be shown in its Twin Cities premiere, Ana's Playground, was filmed in the Cedar-Riverside neighborhood with technical set assistance from Augsburg students. Its short plot succinctly portrays the effects of war on children, earning the film numerous festival awards and qualification for Oscar consideration in 2011. Registration for the Forum is free for all Augsburg students, faculty, and staff. Go to the website for all program and registration information. Check back for more stories about the forum's program, speakers, and activities. The Forum is sponsored by five Norwegian Lutheran colleges—Augsburg, Augustana, Concordia, Luther, and St. Olaf—with generous funding from the Norwegian Nobel Institute.